However, with a little bit of effort and patience, one will realize that it isn’t as daunting as its made to be. We bring to you 15 terms that you need to know before entering the world of stock markets. For a person who has no formal education in finance, terms used in the trading world might be difficult to understand. However, with a little bit of effort and patience, one will realize that it isn’t as daunting as its made to be. 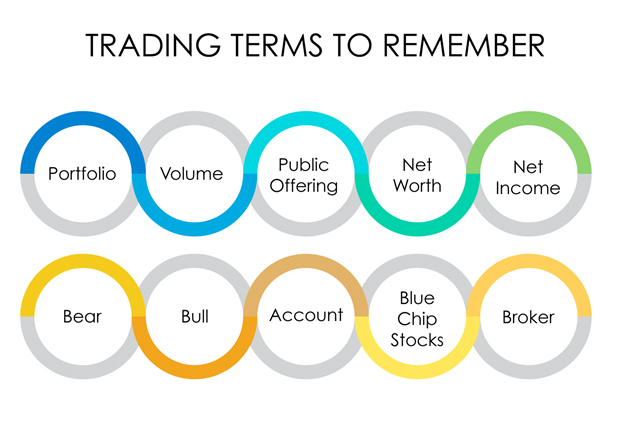 We bring to you 15 terms that you need to know before entering the world of stock markets. 1) Portfolio: A portfolio is a basket of stocks or securities that you currently hold in your account. When somebody talks about having a diversified portfolio, it means that the money should be invested in different sectors and not restricted to a particular sector. 2) Volume: Volume is the number of shares traded during the day. 3) Initial public offering (IPO): When a company wants to raise funds from the public in order to scale up its operations, it does it through an initial public offering (IPO). 4) Net worth: Net worth is the sum of all the assets of a company minus the liabilities. 5) Net income: Net income is the company’s profit from operations. 6) Fiscal year: This is the company’s accounting year with a duration of 12 months. In India, corporations follow the fiscal year starting from April 1 to March 31. Other countries follow different fiscal years, some having it starting from July and majority in January, i.e., the calendar year. 7) Bear: Refers to a person who expects the market or stock to fall in value terms. A market which is falling is said to be bearish. 8) Bull: Refers to a person who expects the market or stock to rise in value terms. A market which is rising is said to be bullish. 9) Account: A record of all your transactions. Also, is known as a Demat account. 10) Asked price: The lowest price one can expect to purchase a share for. The current ask price is the lowest that someone is willing to sell the stock for. 11) Annual report: This is the annual financial report of a company. All the companies listed on the stock exchange are obliged to publish their annual reports. Companies also publish reports every quarter. These reports contain information like company history, organizational structure, equity, holdings, earnings per share, and subsidiaries. 12) Earnings per share: It is the amount of net income made by a company divided by the common stock after dividends are paid to preferred stockholders. 13) Dividend: This is the portion of a company’s earnings that it pays to the shareholders or owners on a quarterly or annual basis. Not all companies pay dividends to its shareholders. 14) Blue-chip stocks: These are the large companies on the stock market. They have a good reputation in the market, give stable and good returns and dividends on a regular basis. 15) Broker: A person or an agency which buys or sells investments on one’s behalf on the stock market. In this case, 5paisa.com is a good brokerage firm offering low brokerage charges in the market.